TAMPA, Fla. -- Editor’s note: Jean François Dujour first came to the University of South Florida in the summer of 2009 as one of a group of teachers from Haiti and the Dominican Republic in a special summer program to learn about teaching democracy in their home nations. The program, funded by the U.S. State Department and carried out by the Patel Center for Global Solutions, had an eye on Haiti’s future. The investment in the teachers -- through increasing their understanding of democratic principles and enhancing their English skills- had the potential to touch generations of Haitian and Dominican children to come. But then came Jan. 12, 2010, and the earthquake which devastated Haiti, killed more than 200,000 people and shattering its schools. Dujour was teaching a class at his school in Léogâne, Haiti, when the earthquake struck. He narrowly escaped the collapsed building. “I thought it was the end of the world,” he later recounted. This fall, Dujour returned to USF to pursue a master’s degree in French and told his story of surviving the earthquake to WUSF’s University Beat. Dujour now is playing an instrumental role in the Patel Center’s ongoing work with training teachers in Haiti as the nation attempts to rebuild its school system. Dujour composed the following essay for USF News to mark the first anniversary of his homeland’s devastation. As we remember Haiti today, we thank all the countries that responded and served in the humanitarian assistance effort. It seems strange that a year has passed already -- the images of my nation’s terrible devastation are as fresh today as if it had happened just an hour ago. January has always been a memorable month in the history of Haiti. It was on Jan. 1, 1804, Haiti became a nation. Then Haitian people did not profit from this victory, they could not afford to practice the very slogan that brought them independence, “L’Union Fait La Force” (translated: “Unity Makes Strength”). Since then, Haitian people have continued to struggle to redress their country and its constant ruin by leaders, misfortune, poverty and disunity. But out of pride, the Haitian people have worked for 205 years to become the world’s first free black nation, to create farms that produced food, cities that produced commerce and schools that produced educated young people -- often for the benefit of the world, but rarely their home country. Fate is unfamiliar to any human science. It was three minutes to 5 p.m. on that Tuesday, a nice day, when in 35 seconds much of Haiti was reduced to rubble and my city became a cemetery. The enemy was terribly harmful, completely invisible, truly unpredictable, and absolutely invulnerable. The adversary used our own shelters and shields to defeat us. Most of us thought that it was the end of the world. The victims were the children, the fathers, the mothers, the teachers, the workers, and government members, good ones and bad ones. The houses, the schools, the churches and the office buildings could not resist; even the Haitian palace collapsed. The world responded and Haiti became the destination for soldiers, journalists, physicians and all sorts of technicians working to rescue victims and help Haitians survive. But in this year, misery has persisted -- and yet the Haitian people press on. Let us not expect someone to come and say, “Let there be light in Haiti” for the light to be. We want the Haitian society to be reunited with all its strength -- the strength which allowed it to set free from slavery -- and to draw on its integrity, dignity, courage, respect, responsibility and determination to fight against misery. 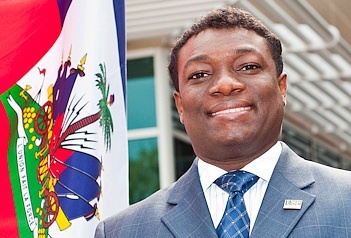 In doing so, Haiti will be revaluing its motto: L’Union Fait La Force. In the year to come, let us make the earthquake the event which shakes and wakes our sleeping solidarity and consciousness.